Sometimes Data alone is just not enough. Check out this story about a site where our supervisor made a stand in order to get the support he needed to fix the root cause. A 100% reduction, that's Impact! A neat story from one of our clients., that I think illustrates the point beautifully that sometimes data alone isn’t enough, sometimes it requires taking a stand to make a change happen. At this parts manufacturer, we manage all their lubrication systems. And with over 150 hydraulic systems alone, this facility generates hundreds of data points each day. One of the many tools we use to help prioritize what all that data is telling us is something called Consumption Alerts. Their job is to highlight and identify changes in how much oil a machine is consuming. 3) The machines that are requiring the most attention due to increased inspection frequencies and top-ups. But even with the very best alerts, it can seem like noise to a maintenance department that is working hard to keep their core processes up and running. Getting their attention is tough. So when the rate of consumption of a specific machine crossed new alert thresholds, our site supervisor knew he had to somehow escalate the issue. He didn’t want this data, this information to be lost within all the other pieces of performance data being fed to the maintenance department on a regular basis, so he decided he needed to take a stand. By Camping out in the maintenance managers office until he was assigned the necessary maintenance resources, he was able to communicate the importance of repairing this non-core aspect of the operation. Now fortunately he had a good relationship with the maintenance manager, fortunately he had credibility by only using this strategy for high priority events, and fortunately it only required ½ hour to identify and make the repairs, but since making that stand, not a single drop of oil has been added to the system. The data was there, it was at the top of the list, but until something occurred that broke the pattern, this leak would have continued to worsen. 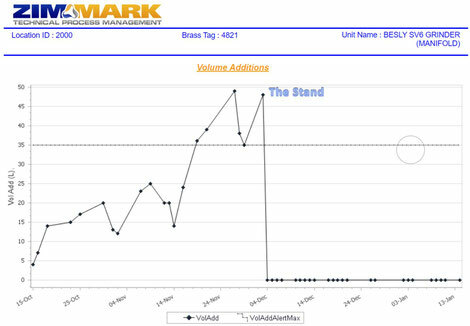 Fortunately what broke the pattern was a proactive event, the stand. Too often change only occurs following a reactive event, a major failure that would have resulted in a production interruption and major equipment rebuild. So my question to you is, where in your plant do you need to take a stand. What process do you know is broken, but will be ignored until there is a major issue or event where its the root cause? The rewards of letting data vs events drive your actions are immeasurable, but it requires rigor, it requires discipline and it requires courage. It requires taking a stand.